While thus employed, king James paid a visit to Cambridge, and Dr. Harsnet, the vice-chancellor, “knowing well the critical and able apprehension of his majesty,” selected the ablest in every faculty to dispute, which was then a mode of entertaining royal visitors. Preston he selected to answer in the philosophy act, and there was a time | when he would have been proud of the honour but his thoughts were now so much fixed on divinity, that the applause of kings and courts had no longer any charms. In the mean time a dispute arose about the place of answerer, which terminated in Mr. Preston’s being appointed first opponent. 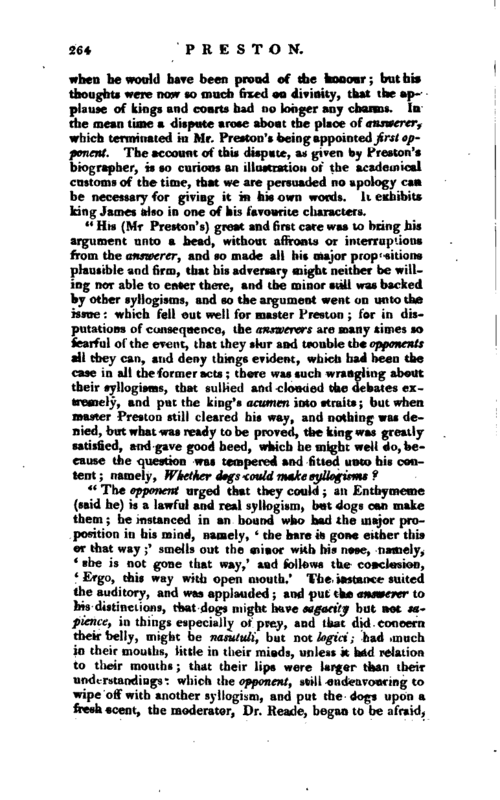 The account of this dispute, as given by Preston’s biographer, is so curious an illustration of the academical customs of the time, that we are persuaded no apology can be necessary for giving it in his own words. It exhibits king James also in one of his favourite characters. "The opponent urged that they could an Enthymeme (said he) is a lawful and real syllogism, but dogs can make them he instanced in an hound who had the major proposition in his mind, namely, ‘the hare is gone either this or that way’ smells out the minor with his nose, namely, ‘she is not gone that way,’ and follows the conclusion, ‘Ergo, this way with open mouth.’ The instance suited the auditory, and was applauded and put the answerer to his distinctions, that dogs might have sagacity but not sapience, in things especially oi prey, and that did concern their belly, might be nasutuli, but not logici had much in their mouths, little in their minds, unless it had relation to their mouths that their lips were larger than their understandings which the opponent, still endeavouring to wipe off with another syllogism, and put the dogs upon a fresh scent, the moderator, Dr. Reade, began to be afraid, | and to think how troublesome a pack of hounds, well followed and applauded, at last might prove, and so came to the answerer’s aid, and told the opponent that his dogs, he did believe, were very weary, and desired him to take them off, and start some other argument and when the opponent would not yield, but halloed still and put them on, he interposed his authority, and silenced him. 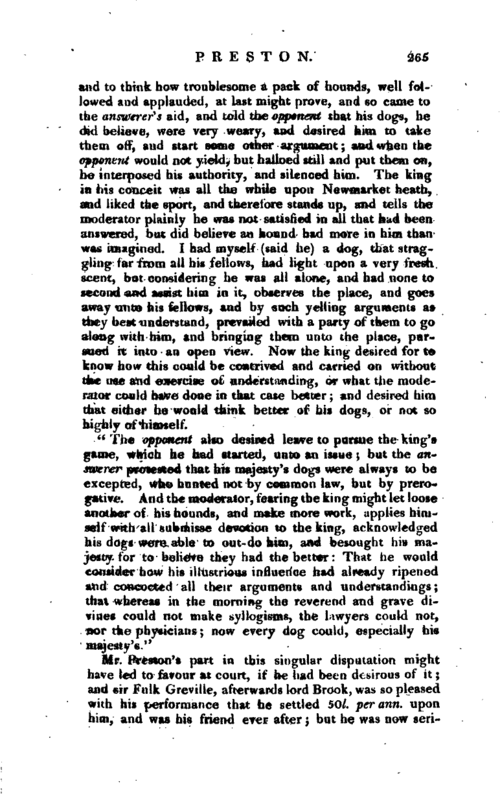 The king in his conceit was all the while upon Newmarket heath, and iiked the sport, and therefore stands up, and tells the moderator plainly he was not satisfied in all that had been answered, but did believe an hound had more in him than was imagined. I had myself (said he) a dog, that straggling far from all his fellows, had light upon a very fresh scent, but considering he was all alone, and had none to second and assist him in it, observes the place, and goes away unto his fellows, and by such yelling arguments as they best understand, prevailed with a party of them to go along with him, and bringing them unto the place, pursued it into an open view. Now the king desired for to know how this could be contrived and carried on without the use and exercise of understanding, or what the moderator could have done in that case better; and desired him that either he would think better of his dogs, or not so highly of himself. Mr. Preston’s part in this singular disputation might have led to favour at court, if he had been desirous of it and sir Futk Greville, afterwards lord Brook, was so pleased with his performance that he settled 50l. per ann. upon him, and was his friend ever after; but he was now | seriously intent on the office of a preacher of the gospel, and having studied Calvin, and adopted his religious opinions, he became suspected of puritanism, which was then much discouraged at court. 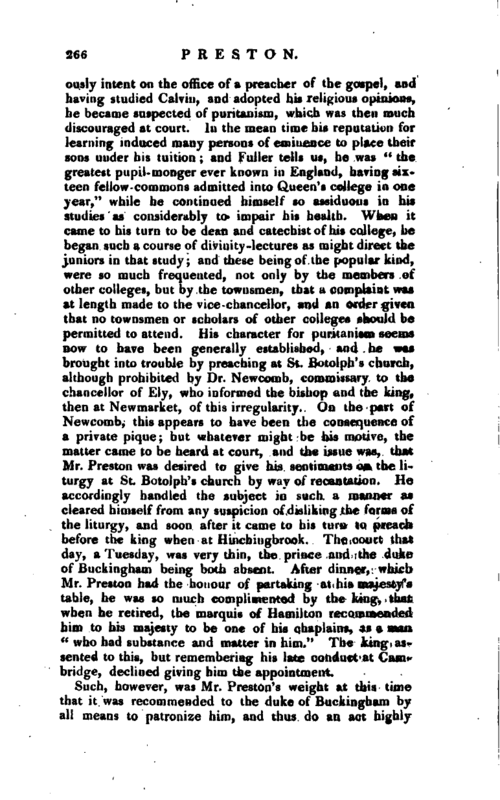 In the mean time his reputation for learning induced many persons of eminence to place their sons under his tuition and Fuller tells us, he was “the greatest pupil- monger ever known in England, having sixteen fellow-commons admitted into Queen’s college in one year,” while he continued himself so assiduous in his studies as considerably to impair his health. 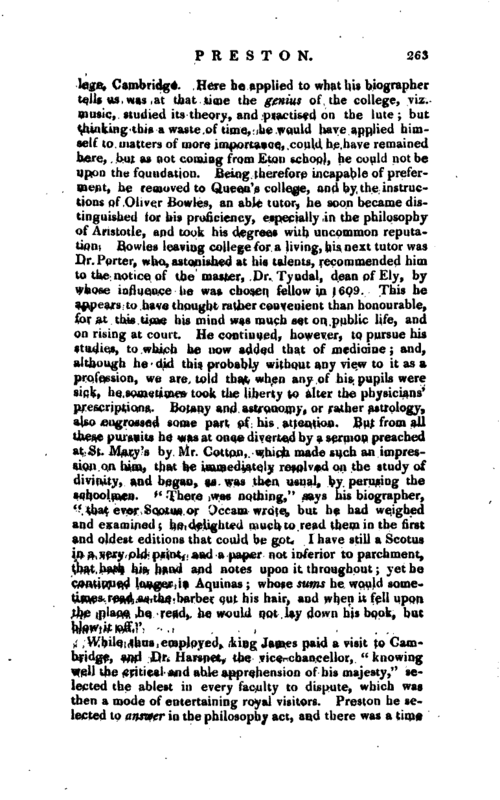 When it came to his turn to be dean and catechistof his college, he began such a course of divinity -lectures as might direct the juniors in that study; and these being of the popular kind, were so much frequented, not only by the members of other colleges, but by the townsmen, that a complaint was at length made to the vice-chancellor, and an order given that no townsmen or scholars of other colleges should be permitted to attend. His character for puritanism seems now to have been generally established, and he was brought into trouble by preaching at St. Botolph’s church, although prohibited by Dr. Newcomb, commissary to the chancellor of Ely, who informed the bishop and the king, then at Newmarket, of this irregularity. 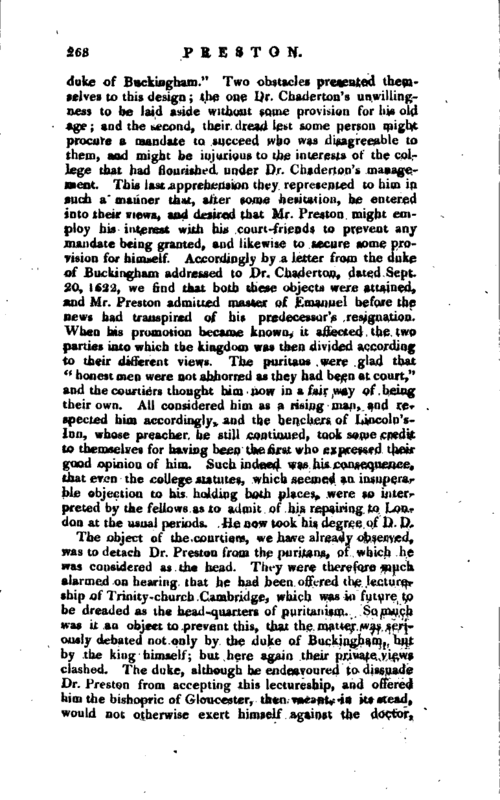 On the part of Newcomb, this appears to have been the consequence of a private pique; but whatever might be his motive, the matter came to be heard at court, and the issue was, that Mr. Preston was desired to give his sentiments on the 1U turgy at St. Botolph’s church by way of recantation. He accordingly handled the subject in such a manner as cleared himself from any suspicion of disliking the forms of the liturgy, and soon after it came to his turn to preach before the king when at Hinchingbrook. The court that day, a Tuesday, was very thin, the prince and the duke of Buckingham being both absent. After dinner, which Mr. Preston had the honour of partaking at his majesty’s table, he was so much complimented by the king, that when he retired, the marquis of Hamilton recommended him to his majesty to be one of his chaplains, as a man “who had substance and matter in him.” The king assented to this, but remembering his late conduct at Cambridge, declined giving him the appointment. Such, however, was Mr. Preston’s weight at this time that it was recommended to the duke of Buckingham by all means to patronize him, and thus do an act highly | acceptable to the puritans who might prove his grace’s friends, in case his other friends should fail. The duke accordingly applied in his behalf to the king, who still demurred, but at last fancied that his favours to Preston might have a different effect from what the duke meditated. The duke wished to court him, as the head of a party; the king thought that by giving him preferment, he should detach him from that party. In this conflict of motives, it occurred to some of Mr. Preston’s friends that it would be preferable to appoint him chaplain to the prince (afterwards Charles I. ), who now was grown up and had a household. Sir Ralph Freeman, a relation of Mr. Preston’s, suggested this to the duke, who immediately sent for the latter, and receiving him with such a serious air as he thought would be acceptable, told him that the prince and himself having the misfortune to be absent when he preached, would be obliged to him for a copy of his sermon, and entreated him to believe that he would be always ready to serve him to the best and utmost of his power. The sermon was accordingly written out in a fair hand, and presented, and the preacher having been introduced to the prince, was formally admitted one of his six chaplains in ordinary. 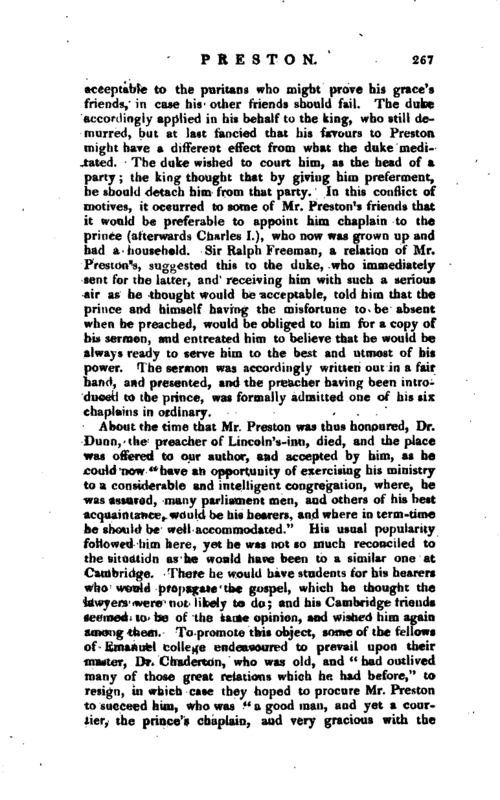 About the time that Mr. Preston was thus honoured, Dr. Dunn, the preacher of Lincoln’s-inn, died, and the place was offered to our author, and accepted by him, as he could now “have an opportunity of exercising his ministry to a considerable and intelligent congregation, where, he was assured, many parliament men, and others of his best acquaintance, would be his hearers, and where in term-time he should be well accommodated.” His usual popularity followed him here, yet he was not so much reconciled to the situation as he would have been to a similar one at Cambridge. There he would have students for his hearers who would propagate the gospel, which he thought the lawyers were not likely to do; and his Cambridge friends seemed to be of the same opinion, and wished him again among them. 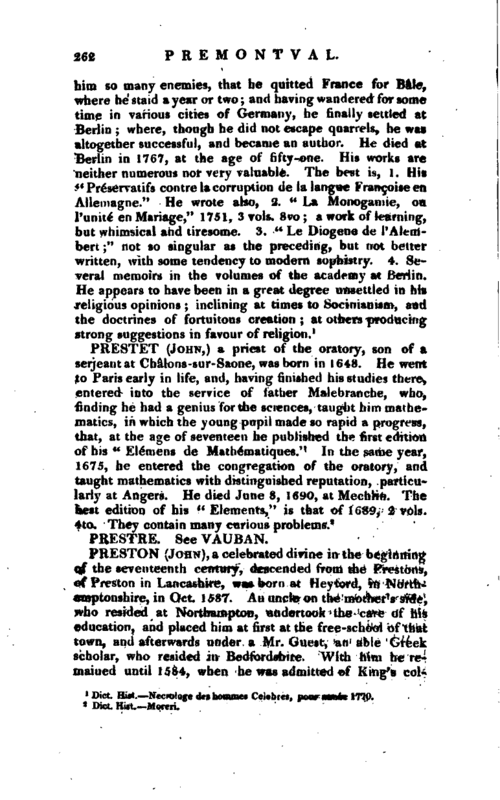 To promote this object, some of the fellows of Emanuel college endeavoured to prevail upon their master, Dr. Chaderton, who was old, and “had outlived many of those great relations which he had before,” to resign, in which case they hoped to procure Mr. Preston to succeed him, who was “a good man, and yet a courtier, the prince’s chaplain, and very gracious with the | duke of Buckingham.” Two obstacles presented themselves to this design; the one Dr. Chaderton’s unwillingness to be laid aside without some provision for his old age; and the second, their dread lest some person might procure a mandate to succeed who was disagreeable to them, and might be injurious to the interests of the college that had flourished under Dr. Chaderton’s management. This last apprehension they represented to him in such a manner that, after some hesitation, he entered into their views, and desired that Mr. Preston might employ his interest with his court-friends to prevent any mandate being granted, and likewise to secure some provision for himself. Accordingly by a letter from the duke of Buckingham addressed to Dr. Chaderton, dated Sept. 20, 1622, we find that both these objects were attained, and Mr. Preston admitted master of Kmanuel before the news had transpired of his predecessor’s resignation. When his promotion became known, it affected the two parties into which the kingdom was then divided according to their different views. The puritans were glad that “honest men were not abhorred as they had been at court,” and the courtiers thought him now in a fair way of being their own. All considered him as a rising man, and respected him accordingly, and the benchers of Lincoln’sInn, whose preacher he still continued, took some credit to themselves for having been the first who expressed their good opinion of him. Such indeed was his consequence, that even the college statutes, which seemed an insuperable objection to his holding both places, were so interpreted by the fellows as to admit of his repairing to London at the usual periods. He now took his degree of D. D. The object of the courtiers, we have already observed, was to detach Dr. Preston from the puritans, of which he was considered as the head. They were therefore much alarmed on hearing that he had been offered the lectureship of Trinity-church Cambridge, which was in future to be dreaded as the head-quarters of puritanism. So much was it an object to prevent this, that the matter was seriously debated not only by the duke of Buckingham, but by the king himself; but here again their private views clashed. The duke, although he endeavoured to dissuade Dr. Preston from accepting this lectureship, and offered him the bishopric of Gloucester, then vacant, in its stead, would not otherwise exert himself against the doctor. | because he would not lose him while the king, having no other object than wholly to detach him from the puritans, sent his secretary to inform him that if he would give up this lectureship, any preferment whatever was at his service. 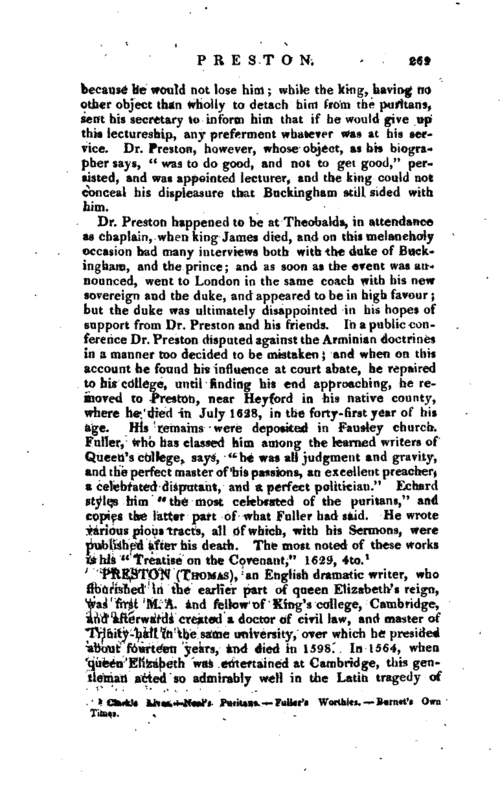 Dr. Preston, however, whose object, as his biographer says, “was to do good, and not to get good,” persisted, and: was appointed lecturer, and the king could not conceal his displeasure that Buckingham still sided with him. 1 Clark’s Lives, Neal’s Puritans. Fuller’s Worthies. Burnet’s Own Times.